So summertime baking. Crank up the air and get at it. I can't complain about being cooped up in the house on a summer's day, as summer is in full swing and although it is only June, it feels like a Memphis August summer. What will it feel like in August for pete's sake? So the first batch was seashells for my Mom's birthday. I sparkled them and shipped them off to Florida. I wanted to say "Thank You" to the nice folks at the Post Office. Yes, the United States Post Office. I was going to make stamps, but I got a little overwhelmed. 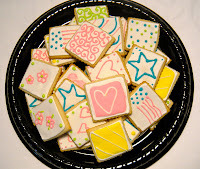 I cut them like stamps and then just decorated them in bright, colorful icing. Cute and delicious. Finally, I decided I needed a little something else to make from the wafers, a break from the Ice Box Cake from the previous post. I found many crust recipes, ice cream sandwich recipes and other ice box cake variations. I decided to launch from a Martha recipe. I would love to make the coconut bonbons in her recipe, sort of a frozen Mounds bar, but my sweet hubby has an allergy (yes honey, we really believe you) to coconut. So I put on my culinary thinking cap and here are my bonbons! The first are made with Hagen Daaz vanilla yogurt. I let it soften and stirred in some Peppermint Snow. This is a holiday product at Williams Sonoma. Yes, it is crushed candy canes, but they are not gooey in the Memphis humidity. I always buy a few jars when they go on post holiday clearance because I love cool peppermint in the summer! So I mix it in really well, and then take a scoop of my peppermint yogurt and put it on a famous chocolate wafer and freeze until firm. If your ice cream is really runny, freeze it so it scoops well. I also made some with pistachio gelato. One of my all time favorites. After freezing the scoops on the wafers, melt some bittersweet chocolate in a double boiler and add about a Tablespoon of Crisco to get it super smooth and a little thinner. 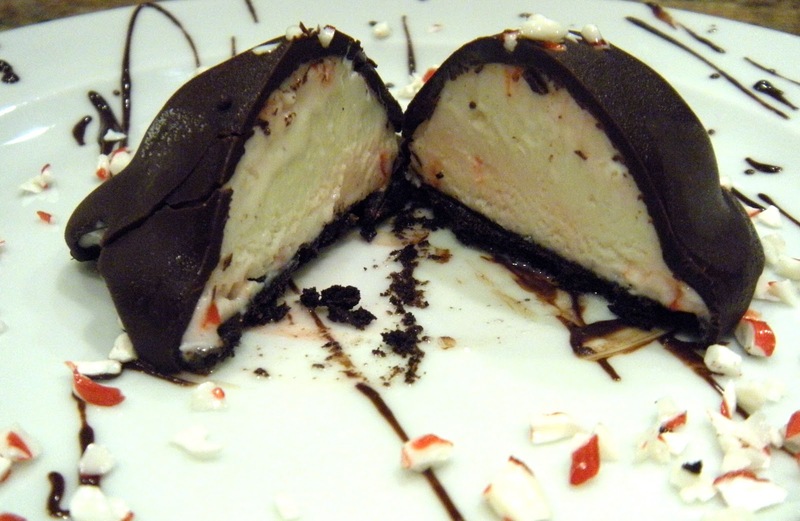 Put your scoops on a wire rack over some wax paper and ladle the chocolate over them to make a bon bon. I sprinkled a little extra pappermint crunch on the chocolate before it hardened and stuck a shelled pistachio on top of that scoop before the chocolate. Put them back in freezer and then enjoy. My family thinks I am the greatest! The hunt for Nabisco Famous Wafers. They may be famous, but they are darn hard to find. Thankfully my neighborhood Schnuck's had a card I could fill out with my grocery requests. All of my requests! Card #4-Heinz White Vinegar, seriously? Why can't I get this this in big jugs to make pickles? Happily I found everything I need now, except the dang Heinz White Vinegar, I guess I'll go elsewhere for that. Any pickle maker will tell you only Heinz will do! Anyway, I got my hands on the wafers, and it appears other people are happy to have them as well. The Gourmet Sleuth says they have been made since 1924. I know we have been enjoying them since the 50's, although, ahem, I was NOT born yet, but I know my siblings were eating them! The recipe on the back of the box is pretty basic, wafers, sweetened whipped cream, vanilla. You slather on the whipped cream and stack them and then chill for a few hours and the wafers soften. As a kid I remember seeing the picture on the box and wishing our Ice Box Cake looked like that. In a family of 7 however, quantity was important. My mom would layer the wafers and whipped cream in a 9x13 pan instead of a loaf pan. We didn't get the cool striped appearance because our wafers were horizontal. But our Ice Box Cake was the best because we added bananas. Yep, bananas. It just tastes like summer. Chocolate, whipped cream and bananas. Perfect for breakfast, snack, dessert. The wafers alone are delicious. A dark cocoa, not overly sweet, and a little toothsome quality. What is that? You get a small little bit, I originally thought it was graham, but upon closer inspection of the ingredients, I discovered there is coconut in them! Not a huge amount, you certainly cannot taste coconut, but you will detect the little flakes. It is part of the experience. So the Petitti family ice box cake is essentially a layer of wafers on the bottom of a 9x13. Slather a layer of whipped cream. Slice banana over the whipped cream and repeat the layers. End with whipped cream on top and cover and chill. When you are ready to serve, crumble some cookie crumbs on top. Cut into squares and enjoy! Since I don't have 7 people here, I decided to make our version of ice box in a loaf like the original because I really wanted those layers! It wasn't exactly the look I wanted. But it is rather like an abstract painting.